In an old joke, the prison camp commander addresses the prisoners: “I have good news,” he says. “Today you will all change underwear. Now you change with you, you change with you. . . “ Dark humor is one way we have of dealing with intolerable situations. It is a sign that our spirit, however abused, hasn’t yet been broken. The Last Cyclist, now playing at Cardinal Stritch University in a collaboration between the theater department and a couple of cultural organizations, gives us a rare opportunity to see, as through an old-time stereoscope, blurry but powerful images of how life was for Jews during the Holocaust. In an brief expository prologue, we learn of the grim conditions in Terezin. Then, we the audience become prisoners who have crowded into an attic to watch a rehearsal of the play. 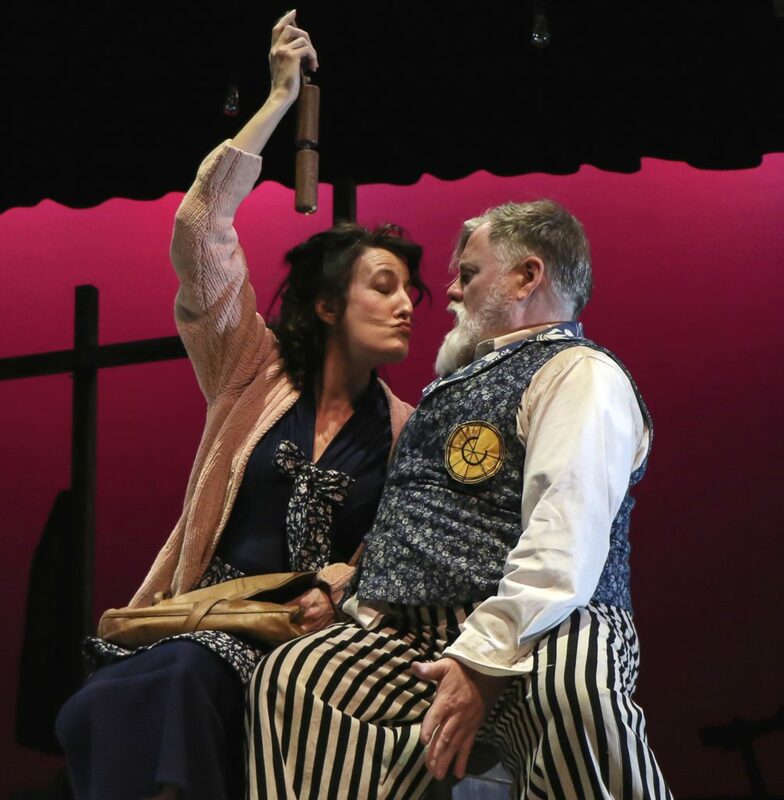 Though the script was reconstructed from memory by a surviving actress twenty years after the fact, then still later reworked into its present form by playwright Naomi Patz, the play retains the flavor of popular comedy of the last century—think Laurel and Hardy or W. C. Fields. There are stock characters, like the naive grocer and the con artist, and hoary routines, like the man hiding in the wardrobe, the humorous courtship, and the wacky courtroom scene. But the comedy cliches serve a deeper purpose and play with much darker undertones. We even see Terezin itself in Horror Island, where the commander brusquely forces the prisoners to act happy for Red Cross inspectors. “Sing loud so they can hear you from a distance,“ he commands them after handing them a propaganda song. But when his back is turned, they change the lyrics to express their true feelings for the camp. The Last Cyclist is that song. Many of the student and professional actors of the cast rise to the challenge of playing so many levels at once. Joel Kopischke, who carries the story as an everyman grocer, brings a strained desperation to his comic grimaces and gestures, as if he could singlehandedly fight off despair. Marcee Doherty-Elst shows her character losing herself in the role of the grandiose leader of the anti-cyclist movement. Monty Kane plays a cynical opportunist with fine physicality, showing us how hard he works to ingratiate himself with the lunatics in charge, while seeming to hardly believe his own shtick. Others take a more low-key approach: Laura Monagle’s romantic lead actress never really forgets the deaths she’s witnessed; Leslie Fitzwater brings moving authenticity to the role of a decent woman realizing that she is at the mercy of unprincipled madmen. Boergers lets us applaud the comedy, but then the players step forward to acknowledge the people they’ve played. 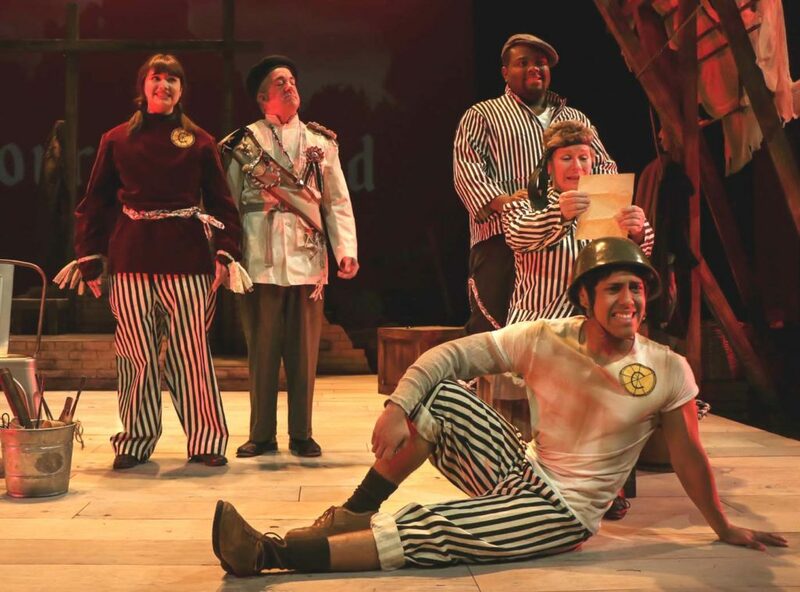 Each actor places a costume piece on the stage and speaks the first name of a long-dead prisoner. The house lights go up. The audience sits for a moment, some dabbing their eyes. Then we leave the auditorium in silence, as we should. Some of the political targets of this satire are long dead and forgotten, but we can still recognize their types. It’s hard to say who is worse: the madmen who persecute the innocent or the cynical sane people who let them take power. We have been warned — again.